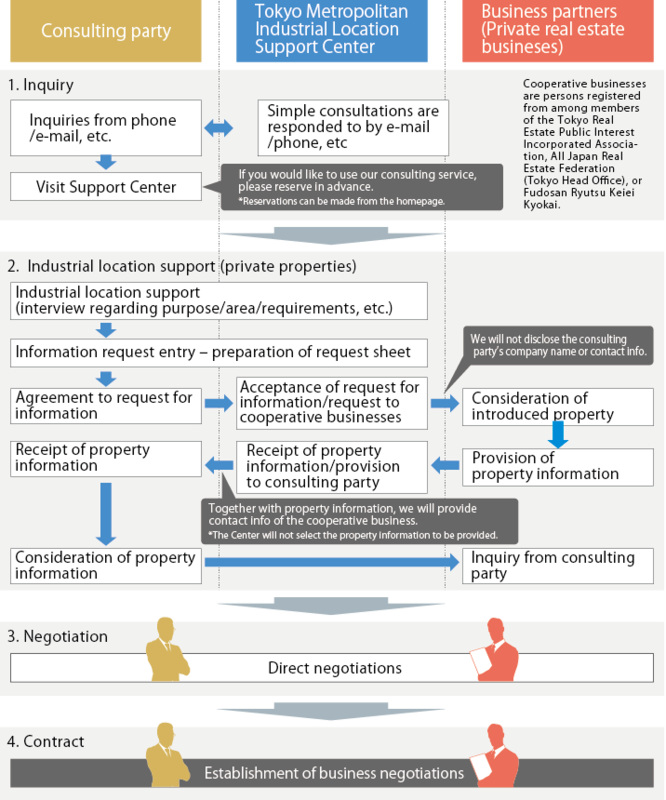 ■What is Tokyo Metropolitan Industrial Location Support Center? information according to the details of your consultations, etc. Tokyo Metropolitan Industrial Location Support Center operates a one-stop service that introduces support systems in Tokyo and its municipalities for companies and individual businesses looking for industrial locations in Tokyo, as well as information regarding business sites, vacant offices, factories and shops in cooperation with wards/municipalities and real estate businesses. Specialist staff with expertise in real estate, and specializing in industrial locations, provide a quick and comprehensive consulting service. We refer to private cooperative businesses and provide information on private properties such as business sites and vacant offices, factories and shops, etc. We research properties that suit the details of your consultation from among the information on properties owned by public organizations, stocked by the Support Center. We introduce wards/municipalities providing support through all kinds of subsidiary aid and assistance systems, etc. that can be used according to industry type and scale of business, etc. *The Center will not participate in negotiations and contract agreements, etc. ・Use of the Center does not guarantee that the consulting party will be provided with real estate matching its requirements. ・The consulting party must guarantee to the Center that he/she is not part of a criminal organization or any related organization. ・The Center does not make a definite promise of the issuance of subsidiary aid, etc. from a municipality introduced to the consulting party. ・When a decision has been made regarding a real estate location for which information was provided, a “Location Completion Report” is to be submitted to the Center. Copyright© TOKYO METROPOLITAN GOVERNMENT All rights Reserved.